LOS ANGELES – May 18, 2016 – The highly anticipated 2016 Team Shelby East Coast Grand Nationals will celebrate the high octane lifestyle enjoyed by club founder Carroll Shelby. 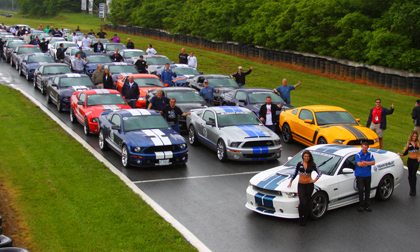 Organized by the Team Shelby Northeast Region, the Grand Nationals will include a day of high-speed track time followed by a 100 mile spirited drive across the picturesque countryside to the Carlisle Ford Nationals for car shows, presentations and parties from June 3-5, 2016. The Team Shelby Grand Nationals begins on June 2 with a full day of on-track fun managed by SMC Events at Summit Point Raceway in Summit Point, West Virginia. That night, Ford historian John Clor will be the keynote speaker at a special banquet. The next morning, Team Shelby will host an exhilarating Poker Run to the fairgrounds in Carlisle, Penn. On Friday night June 3rd, Team Shelby will invade the Ford Expo Center for a Texas style BBQ banquet. Speakers will include executives from Shelby American and Ford Motor Company. Saturday, June 4th, is the busiest day at Carlisle with about 3,500 Ford vehicles on the show field.Highlights will include a burn-out competition conducted by Ford Carlisle, ride and drives by Ford Motor Company and hundreds of vendors. Team Shelby will host a hospitality tent near the Ford Expo Center for Grand National attendees throughout the weekend. Later that day, members can line up for a short cruise to downtown Carlisle. The center of town is blocked off and only the parade cars are allowed to drive in and park.Team Shelby members can enjoy live music, restaurants and shops around the center square throughout the evening. Information about the 2016 Team Shelby East Coast Grand Nationals is available online at http://www.teamshelby.com/forums/index.php/topic/91213-ponies-at-the-point-2016-team-shelby-east-coast-grand-nationals/.